Although we are not sure when the Post Office first opened in Santon Downham, the date stamp was issued in 1924; so this could be a guide. Rene and Dennis Abigail took over the in September 1964. 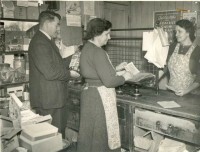 The previous Postmaster and his wife (Mr & Mrs Walter Woods) had been there for 25 years and had provided the community with not only Post Office services, but also the basic food rations during the war years. There were at least three other Postmasters that we know of -Mr Macdougal, Mr Claxton and Mr Matthews, in that order. 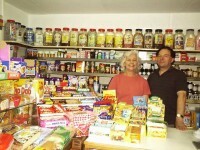 When Rene and Dennis came, they gradually increased the stock over the years and now sell a variety of frozen food, confectionery, stationery and grocery and many other things too. There have been many changes in those 36 years (now 52 years!!!). The village, which was owned by the Forestry Commission, has gradually become a community owning their own private properties; new houses and bungalows built on land sold to them by the Forestry Commission and existing houses bought by the tenants. Also the surrounding forest area has been opened up to the public for recreation: i.e. picnic areas, nature trails and bridle paths for riding. This has all helped to bring in some extra business for the shop. Sadly the Post Office closed, in 2000 but the Village Shop remains open to offer a service to the village for some time to come. Customers are still able to purchase postage stamps (and Rene will still weigh parcels for you on the old Post Office scales). The posting box, which was installed during the reign of George VI remains in the same place, and the post is collected at the same times each day but the Sunday collection stopped in 2007. These photos of the Post Office circa 1952 were provide by Jo Greenwood who’s grand parents (Mr and Mrs woods) ran the Post Office at the time. The Post Office as it is now the the Village Shop. Many people still refer to it as “The Post Office”.